Considered among the greatest artists in history, Rembrandt van Rijn was highly accomplished both as a painter and a printmaker. 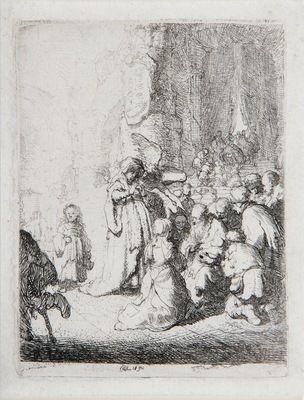 The original etching on display was executed early in the artist's career in Leiden, a year before he moved to Amsterdam. Rembrandt's expressive use of lighting in the etching was influenced by the early Italian Baroque painting style of Michelangelo Merisi da Caravaggio (1571-1610).